Lucas Oil Raceway in Brownsburg has been known for decades as the place to go for thrilling motorsports&apos; events. But are you ready for some big news? This summer, the famous track adds another level of excitement as it welcomes a brand new event from the Red Bull Global Rallycross series. This new event will mark the first time Central Indiana has hosted this type of racing, which combines the speed of an oval track race with the intensity of an off-road showdown. How will this race be different from any others you&apos;ve seen at Lucas Oil Raceway or in Central Indiana? In this race, drivers start on the backstretch of the oval, moving through Turns 3 and 4 and building up speed. After the drivers complete Turn 1, they will turn left into the infield. In the infield, drivers will have to tackle not only a section of dirt, but also a 70-foot jump. There&apos;s also a Joker Lap, and drivers who take this path directly into the dirt can save over five seconds per lap. It&apos;s an intense racing format that is unlike any other, and because it&apos;s at the Lucas Oil Raceway oval, you can be sure that anywhere you sit, you&apos;ll have a great view of the action. There isn&apos;t a bad seat in the house, and that makes Lucas Oil Raceway one of our family&apos;s favorite places to enjoy motorsports. 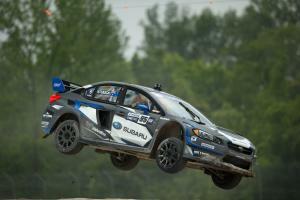 The event will feature drivers from all over the world, but many of the Red Bull Global Rallycross teams make Central Indiana their home. Seasoned racing fans will recognize names like Andretti, Dreyer & Reinbold, Rahal and Letterman among the Hoosier-based teams. Bringing the Red Bull Rallycross to Central Indiana is an exciting and important expansion of the area&apos;s already rich racing legacy, and I personally can&apos;t wait to see this first-time event at Lucas Oil Raceway. 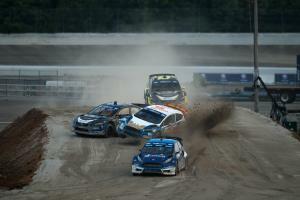 Ready to secure your tickets for the Red Bull Rallycross kickoff? We actually have a great discount code provided exclusively to Visit Hendricks County readers and followers. Click here and then use the promo code HENDRICKS35 for 35 percent off general admission tickets. Tickets: Can be purchased online, kids 12 and under are free with a ticketed adult!